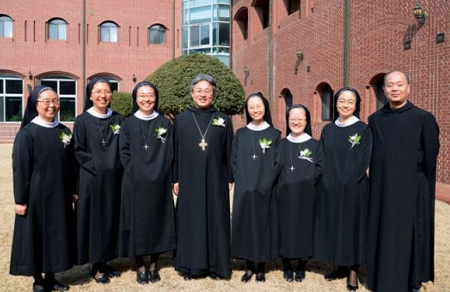 On the Feast of St. Scholastica the Eucharistic Celebration for the Final Profession of Sr.
Macrina Oh, Sr. Marie Enoch Kim, Sr. Deborah Yu, and Sr. Marie Sohwa Yoon was held at 11 AM Tuesday, February 10th in the chapel of Daegu Priory House. The Mass was officiated by the Reverend Abbot Blasio Park, OSB and 17 priests co-celebrated the Mass. The Sisters from all parts of the country and over 650 families, relatives, friends, and guests of four Sisters of Final Profession were present at the Mass. The participants were moved by a solemn and stirring moment to make their vows to follow Jesus their whole life. It was most joyful and memorable to see the affirmation and warmth radiating from the Final Professed Sisters as Abbot Blasio, the Concelebrants, Sisters, family members and friends congratulated them.